We’d love your help. Let us know what’s wrong with this preview of Sleeping in the Ground by Peter Robinson. At the doors of a charming country church, an unspeakable act destroys MICHAEL CONNELLY calls Peter Robinson "an author with amazing empathy, a snare-trap ear for dialogue, and a clear eye for the telling detail." To ask other readers questions about Sleeping in the Ground, please sign up. Just finished this book last evening and maybe I didn't pay close enough attention, but what does the title "Sleeping in the Ground" refer to in the story? Spoiler answers fine as I've read the book. I won this book in the giveaways but i realized it was a book in the inspector banks series. Do i need to read it from the first book or can i read it as a standalone? Twenty fourth in series and still pretty darn fantastic. Impressive, and since I have read this series from the beginning, that means I have been reading this series for almost 2/3rd's of my life. A wedding and a funeral, beginning and endings. Of course the wedding doesn't turn out well, pure understatement there, and the person in the casket had secrets not revealed to Banks until forty years later. Also, some things are never truly over, there is guilt and revenge, and some people just don't Twenty fourth in series and still pretty darn fantastic. Impressive, and since I have read this series from the beginning, that means I have been reading this series for almost 2/3rd's of my life. A wedding and a funeral, beginning and endings. Of course the wedding doesn't turn out well, pure understatement there, and the person in the casket had secrets not revealed to Banks until forty years later. Also, some things are never truly over, there is guilt and revenge, and some people just don't care about new beginnings. This series is one of the best police procedurals around, well written, tightly plotted, and some very interesting character that have gone through some harrowing times. Banks himself, is a complicated, multi faceted character. Love music, poetry and this series always contains some of these. Introspective, but beginning to rethink his solitary life as he is getting older. Just a balanced mix of case and personal. A series well worth reading. This is the twenty-fourth entry in Peter Robinson's series featuring Inspector Alan Banks a member of the police department in the fictional town of Eastvale in the north of England. Through the years, Banks has risen through the ranks and is now a Detective Superintendent, overseeing a group of detectives. As the book opens, Banks is at a funeral. It's a particularly difficult one for him, since the woman who has died was the first girl he ever loved. While they were still in college, she broke This is the twenty-fourth entry in Peter Robinson's series featuring Inspector Alan Banks a member of the police department in the fictional town of Eastvale in the north of England. Through the years, Banks has risen through the ranks and is now a Detective Superintendent, overseeing a group of detectives. As the book opens, Banks is at a funeral. It's a particularly difficult one for him, since the woman who has died was the first girl he ever loved. While they were still in college, she broke up with him, refusing to explain why, and he had not seen or heard from her in over forty years. But as is so often the case with your first real love, Banks has never forgotten her and is deeply saddened by her death. Banks had turned his cell phone off for the funeral and in his melancholy, forgets to turn it on until he leaves the train after arriving back home. When he turns it back on, the phone explodes with texts and voicemail messages demanding his urgent attention. A sniper has opened fire on a wedding party leaving a church in a small village near Eastvale. Seven or eight victims are down and the gunman who fired from a hillside overlooking the entrance to the church has escaped. In the confusion, only one person even caught a fleeting glimpse of him. Banks arrives on the scene to find total chaos. Four people will ultimately die of their wounds, including the bride and the groom. One of Banks's detective who was in the party has suffered a minor wound but will recover. Banks now takes charge of an investigation that will naturally unfold under intense media pressure. Many questions need to be answered: Was this a terrorist attack? Did the gunman have an intended target or targets, or was he just firing randomly into the wedding party? Why did he select this particular wedding party? Inevitably, this will be a very broad investigation which must look into the background of all of the victims in an effort to determine if any of them had an enemy who might have attacked them. Banks will be reunited with Jenny Fuller, a profiler from an earlier case, who will join the investigation in and effort to point them in the direction of the sort of person who might have committed such an horrendous crime. Throughout the book, he will continue to be haunted by the death of the woman he had loved. This novel was an amazing surprise! Upon receiving this novel, I was very hesitant about reading it not knowing how I would feel reading the twenty-fourth book in a series. I thought I would be lost with no idea about what was going on within the story or the characters. Man, I'm happy I was wrong on that account. Yes, reading the previous novels in this series probably would help in understanding the characters more and their backgrounds along with previous crimes; however, it was not a necessit This novel was an amazing surprise! Upon receiving this novel, I was very hesitant about reading it not knowing how I would feel reading the twenty-fourth book in a series. I thought I would be lost with no idea about what was going on within the story or the characters. Man, I'm happy I was wrong on that account. Yes, reading the previous novels in this series probably would help in understanding the characters more and their backgrounds along with previous crimes; however, it was not a necessity. This book was also amazing as a standalone. For those who love shows similar to CSI, Criminal Minds, Chicago PD, etc: this book is for you! While reading, I felt like I was reading an episode that was being acted out in my head except with a book you get way more detail. It was awesome! As much as there is a main character of Alan Banks, he's not the only main character. There is a team within his department that also could be considered as main characters (they were to me at least). I really liked this unique aspect to the novel where it didn't feel like it was a sole person's responsibility to solve a crime and instead was more realistic including a network of people. As for the story, it was extremely well done, definitely one of my favourite murder mysteries of this year (if not one of my favourites ever). It caught my attention from the beginning and I didn't once get bored. I was enthralled in the story and I wasn't able to predict the suspect.....at all. I was able to predict it at one point in the story but that was essentially when it was confirmed. That's a rarity for me. Typically, I'm able to predict the murderer and then I spend the rest of the novel waiting to see how that suspect is discovered. I hinted at this above but I also really loved the detail of this novel. Although it's a fictional story, it felt well researched. There was scientific and forensic techniques mentioned that added immensely to the story. It made the story one thousand times more realistic than the average murder mystery novel that doesn't reference any of the actual science behind a murder and how it's necessary for evidence. This book was amazing! Very happy to have read it and I hope to read more from Peter Robinson in the future! The Inspector Banks series is one of my favorites and once again Peter Robinson proves that he can write a damn good mystery. This, his latest effort, is a very strange tale and a little different from his other books. On the very first page, a wedding party is joyously leaving the church, when a sniper start picking them off one by one. In an attack that only lasts for minutes, the bride, groom, groom's father, maid of honor, and bride's maid are dead and several others are injured. It is a begi The Inspector Banks series is one of my favorites and once again Peter Robinson proves that he can write a damn good mystery. This, his latest effort, is a very strange tale and a little different from his other books. On the very first page, a wedding party is joyously leaving the church, when a sniper start picking them off one by one. In an attack that only lasts for minutes, the bride, groom, groom's father, maid of honor, and bride's maid are dead and several others are injured. It is a beginning that will leave you somewhat shaken and that is just for starters. By page 100, it appears that the murderer is identified, although the motive is unknown. No spoilers here but have you ever read a 300 page police procedural where the murderer is captured almost immediately? Banks has doubts and starts digging into past history to see if there are any clues to what might have caused this massacre. I've been a fan all along. However, I found this addition to the series quite tedious as the plot evolved. Also, the musical references, which I once thought of as entertaining, are so numerous as to become irritating to me. Although I have not followed DCI Banks religiously from the start, I am pretty fond of him. I decided to read Sleeping in the Ground for Yorkshire Day. Sleeping in the Ground is the twenty fourth book from Peter Robinson. Impressive! Yorkshire Day is celebrated on 1st August every year. It all starts with a wedding and a funeral. A sniper has taken out people at a wedding. Blood shed. Murder. A red wedding. A rampage killer is at large, in a gorgeous Yorkshire Dales setting. Banks and Annie, his Although I have not followed DCI Banks religiously from the start, I am pretty fond of him. I decided to read Sleeping in the Ground for Yorkshire Day. Sleeping in the Ground is the twenty fourth book from Peter Robinson. Impressive! Yorkshire Day is celebrated on 1st August every year. It all starts with a wedding and a funeral. A sniper has taken out people at a wedding. Blood shed. Murder. A red wedding. A rampage killer is at large, in a gorgeous Yorkshire Dales setting. Banks and Annie, his long term side kick, are drafted in to solve this unusual case. It appears to be an open and shut case. On a personal level, Banks is mourning the death of his first love. This causes him much reflection. Robinson shows that he is top of his game with Sleeping in the Ground. He describes a truly terrible event, with such expertise and humanity. We get a real sense of the slaughter at the wedding, as the guests are shot or dying. It is carnage. There is no sense of the author exploiting this. I was moved and chilled to the bone. I like Banks. Although he is a bit of a misery guts and far too introspective. His love of poetry is quirky and slightly irritating. No one really likes poetry do they? He is probably a little bit too posh for me. He is a top detective, with decent instincts. I also love his team. Jenny Fuller is back from Australia and working as a profiler on the case. They have a past. I wanted to shout at Banks. Stop over thinking. Just get together with Jenny. Do it! I am sure men do not over think like that. But don’t be put off by the graphic violence in this chapter – it serves it purpose well – it reminds us that people are suffering, it connects the reader with the brutal event and the survivors and the first chapter is the only truly gruesome scene in the book. We read on to discover the motivation of the villain, we discover the long reaching effects of the crime, the effects on those attending the wedding - injured or not and the effects on those who have to deal with these types of situations – the medics, doctors, police… It is a shocking reminder that these type of events happen to real people, not to two dimensional characters on a screen. I have read every DCI Alan Banks and they are now very familiar and comfortable reading experiences. It's not like the books have become interchangeable or stagnant, but there are features which tend to reappear. For example the books are all set in Northern England, in and around Eastvale a small town in Yorkshire. They feature Alan Banks, a smart, music-loving, working-class bloke who became a policeman for no apparent reason and has advanced up the ranks to his current title of Detective Supe I have read every DCI Alan Banks and they are now very familiar and comfortable reading experiences. It's not like the books have become interchangeable or stagnant, but there are features which tend to reappear. For example the books are all set in Northern England, in and around Eastvale a small town in Yorkshire. They feature Alan Banks, a smart, music-loving, working-class bloke who became a policeman for no apparent reason and has advanced up the ranks to his current title of Detective Superintendent. The supporting characters in the books have evolved (and grown more prominent) in the more recent books, with Robinson adding DI Annie Cabot, Chief Superintendent Catherine Gervaise and DC Geraldine "Gerry" Masterson to balance out the central role Banks plays. Sadly, in SLEEPING IN THE GROUND, my favorite supporting character , DS Winsome Jackson hardly appears (for reasons I won't divulge here). In addition to the main mystery we get a lot more internal dialogue from Banks as he ponders his romantic future and past. A blast from the past, the lovely psychological profiler Jenny Fuller who appeared in some of the very early (like books 8-11) Banks books, has returned to Eastvale and she ends up working with the police to try and identify and understand the mind of a person who can shoot a dozen shots into a wedding (killing both bride and groom). In addition to Banks we also follow Annie's thoughts for awhile. Even more importantly we also get the POV of Gerrie, who is the most junior member of the team but who eventually makes the most important breakthroughs leading to the eventual denouement and resolution of the case at hand. 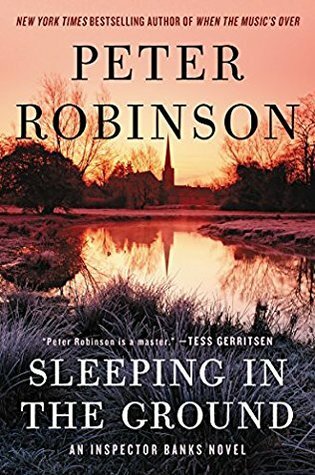 Overall, SLEEPING IN THE GROUND is a better than average entry into the British police procedural oeuvre, and for longtime Robinson readers like myself, an enjoyable and familiar diversion. Peter Robinson's Inspector Banks series is one of my hands down favourites. Sleeping in the Ground is the 24th entry. I have such a delicious sense of anticipation when I open the cover of the latest Banks. I had no idea what the plot was about, but knew I would be in for another great read. I wanted to catch up with characters I've come to know and appreciate. What has gone on in their lives? Robinson keeps them moving forward in real time with each new entry. Sleeping in the Ground opens with a Peter Robinson's Inspector Banks series is one of my hands down favourites. Sleeping in the Ground is the 24th entry. Sleeping in the Ground opens with a wedding - and a funeral. A unknown gunman opens fire on a countryside wedding, killing and wounding many. Banks is away attending the memorial service of his first love from forty years ago, when he is called to the scene. He's become quite introspective with her passing, looking at his own life and decisions. But, it seems to be manifesting itself in anger and short tempered outbursts - quite unlike the usually composed Banks. The killer is identified early on in the book and I wondered where the book could go from there, as there were still many pages remaining. Banks has some niggling doubts though and continues to investigate even as the case is declared solved. Robinson's plot was inventive and completely unpredictable. I truly enjoy being surprised by a mystery as I read so many. Robinson excels at both plotting and characterizations. As I mentioned earlier, I read this series as much for the mystery as for those who populate the pages. Familiar supporting players are back, including one from Banks' past. The settings and descriptions have me yearning to sit in a pub with a packet of crisps, catching up on the latest. As always, I enjoy Bank's music selections. I've often put the book down to look up and listen to a song that is playing in the book, curious as to how and why it fits that particular scene or moment. Banks is also into poetry now and those references are also well suited. I have to admit I came late to this series. I only started about 4 or 5 years ago, I have managed to read in order with some mammoth binge sessions, to catch up on. This one easily lives up to the standard of the previous 23. That is one hell of an achievement to hit the mark every time. It was unusual to have chapters over 6-10 pages long, I think some were over 30, which is very unusual nowadays. But it works, there is a lot of detail, but not too much. The author obviously knows and loves the setting. what a shame...I love Banks, but this book was a lot to do about nothing. Even the ending which could have been exciting and threatening was anticlimactic. Are we just writing and reading because we don't know how to end Banks? It's a beautiful day for a wedding. But suddenly shots are fired and both wedding party members as well as guests are left dead and bleeding. It takes the police as well as emergency vehicles longer than normal to get to the dying, bleeding and wounded. By the time they do...the shooter is gone...there is no sign of him anywhere. Inspector Banks...on his way home from a funeral...ends up at the crime scene where there is confusion as well as chaos. No one has seen any sign of the shooter except perhaps a youth staying at a hostel. But a conversation with him leads Inspector Banks and his team no where. I love these books and I think I have read almost all of them. They are filled with mystery, tea, fried breakfasts, meaty pies and complexities. I love the character of Inspector Banks. I truly enjoy the way these books are written. I love watching the mystery unfold. It's just a perfect book to snuggle up with on any kind of a day...beachy, rainy, snowy! Sleeping in the Ground by Peter Robinson is a very difficult book for me to rate. This is book number 24 in the series and it is the first time that I have read any of the author's books. Because I haven't read the previous books, I got a little bit lost with the characters. But I found Inspector Banks very interesting. He had attended a funeral of his first love of many years ago and that jarred him. The relationship had been broken off suddenly but he never knew why. Even though he married lat Sleeping in the Ground by Peter Robinson is a very difficult book for me to rate. This is book number 24 in the series and it is the first time that I have read any of the author's books. Because I haven't read the previous books, I got a little bit lost with the characters. But I found Inspector Banks very interesting. He had attended a funeral of his first love of many years ago and that jarred him. The relationship had been broken off suddenly but he never knew why. Even though he married later on, this was his one true love. So there is sadness hanging over him. He had a great love of music, and I enjoyed reading about his choices. He recognized music as a great healer and comforter in his life. At the time that Inspector Banks was attending the funeral, a sniper invaded a wedding party and there were vivid scenes of the bride, the groom, bridesmaids being shot plus others at the wedding who were injured. When the clues were put together, the police were very happy because they thought that they had found the sniper. A retired dentist was found with a fatal bullet through his mouth plus clippings with underlined words in red. I did not buy it. Was the dentist the sniper? I really loved rich characterizations of the Inspector and the other main characters in this book. I just wish that I had started with the first installment. Banks is a detective I have been reading for years and installment #24 doesn't disappoint. It opens with a sniper attack on a wedding, a shocking event no matter where it occurs but in rural Yorkshire it is incomprehensible. Banks is faced with a puzzle that has not obvious point of entry to a solution. This novel relies on plodding police work, and noticing the tiniest irregularity. Banks is called in to work on his way home from a funeral. The person who has died was one of Bank's first loves, Banks is a detective I have been reading for years and installment #24 doesn't disappoint. It opens with a sniper attack on a wedding, a shocking event no matter where it occurs but in rural Yorkshire it is incomprehensible. Banks is faced with a puzzle that has not obvious point of entry to a solution. This novel relies on plodding police work, and noticing the tiniest irregularity. Banks is called in to work on his way home from a funeral. The person who has died was one of Bank's first loves, and her funeral is a reminder to Banks of how quickly life can go by. As always, Banks is a repository of musical knowledge. Music serves many purposes for Banks - to clear his mind, and to think deeper. Single malts and local beers are mentioned often providing a treat for readers who know them or don't and have something to look forward to. Annie is still part of his team, as well as a new team member, Gerry, a profiler and someone Allan was involved with years earlier. After 24 books I still care about Inspector Banks. I'm glad other characters I have liked in the series are still alive vs the televised version of Banks and his team. I enjoy both for different reasons. This book opens with a shocking mass killing of members of a wedding party post ceremony. The investigation becomes focused on events decades old as Banks in his personal life also visits the past. Opposite of a page turner. Forced myself to get through it. Boring. This is my first book by Peter Robinson so, admittedly, I'm a little late coming to the Inspector Banks party since this is the twenty-fourth book in the popular series. This book starts out with an impressive bang - actually, many bangs as several guests are gunned down at a wedding. Inspector Banks, along with some of his law enforcement cronies, are brought in to figure out the identity of the shooter. The mystery itself was good, with twists and culprits sprinkled liberally throughout, but th This is my first book by Peter Robinson so, admittedly, I'm a little late coming to the Inspector Banks party since this is the twenty-fourth book in the popular series. This book starts out with an impressive bang - actually, many bangs as several guests are gunned down at a wedding. Inspector Banks, along with some of his law enforcement cronies, are brought in to figure out the identity of the shooter. The mystery itself was good, with twists and culprits sprinkled liberally throughout, but the momentum of the mystery was hampered by the constant inclusion of numerous side stories. I realize that these characters have pasts and side stories help to flesh them out to readers but I think it was to the detriment of the mystery. Granted, I didn't have the background of these characters since I haven't read the previous books but with so much time devoted to relationships and mouth-watering descriptions of the food they ate, I felt like the mystery was being interrupted too often and I was unable to invest myself into it as much as I wanted to. As the pages were dwindling, the tension suddenly ramped up to an intense, nail-biting ending but this conclusion felt too swift leaving me feeling a little put out at its abruptness. Overall, this slow burn suspense read will probably be viewed more favourably with fans of the series. The mystery aspect was wonderfully twisty but with less interruption from side stories the tension would have been higher and I would have given it a higher rating. Although the story was interesting and solving the mystery of who the killer was, I thought it was bogged down with too many extraneous details, especially all the music Banks listens to all the time. A good editor could have cut a lot of this side track to tighten the story and keep the reader from skimming through many of the pages like I did. I won this free book from Goodreads First Reads. A wedding was about to begin; gun shots into the wedding party and family changed a wonderful day into a murderous mayhem. Who had such revenge to kill so many? After unraveling a mystery they found the killer hiding in plain sight. Good entry into the always interesting DCI Banks series. This one starts with a mass murder at a church and ends in a rainstorm/flood. In-between we get a good look into the life of a beginning to age inspector who looks back on his life, sometimes confused, sometimes contented. I would read this series from the beginning because the character is constantly evolving. Highly recommended. The story line is a bit predictable and the characters are getting a bit jaded, I think its time Banks retired. I have enjoyed the previous novels but the mis-casting of Stephen Tompkinson in the TV serialisation has spoilt it all for me. I doubt I would buy anymore if there are any. Despite numerous digressions to discus various characters musical preferences which I find distracting, Robinson presents an interesting enigma for DCI Alan Banks in this novel. At a wedding, a sniper takes aim at the wedding party and guests managing to kill several people including the bride. A suspect is found who fits the crime but he has committed suicide before he can be located. At a minor celebrity wedding in a remote country church a gunman opens fire from a distant hill. Within a minute three are dead (including the bride) and seven more injured. This is the devastating opening scene of the novel. Yet, rather than pile on the shock/horror tactics, Peter Robinson slowly walks us through the scene as it happens. A fine example of how effective understatement can be and of a master of the genre at the top of his game. Whilst this is happening, Detective Superintendent Al At a minor celebrity wedding in a remote country church a gunman opens fire from a distant hill. Within a minute three are dead (including the bride) and seven more injured. This is the devastating opening scene of the novel. Yet, rather than pile on the shock/horror tactics, Peter Robinson slowly walks us through the scene as it happens. A fine example of how effective understatement can be and of a master of the genre at the top of his game. Whilst this is happening, Detective Superintendent Alan Banks is returning home from the funeral of his first serious girlfriend, whom he hadn’t seen for over thirty years. The themes of loss and how seemingly insignificant events from the distant past can dramatically effect the present run like a leitmotif throughout the novel; both in Banks’s personal life and the main crime. Although it looks as though the culprit is soon discovered; a local gun enthusiast who commits suicide after the massacre; forensics soon unearths some anomalies and Banks and his team realise the solution is far more complex than first thought. Favorite author fails with this one. Two-thirds of the way through this, I found myself still waiting for the story to get started. Having read 18 Inspector Alan Banks mysteries to date, sure there have been some I have liked more than others. But I have liked them all until this one. Before I was 100 pages in, I added a note, "Has anyone edited this book?" There were multiple times that something would be discussed, then a page later discussed again. A good example is the list of victims the pat Favorite author fails with this one. Two-thirds of the way through this, I found myself still waiting for the story to get started. Having read 18 Inspector Alan Banks mysteries to date, sure there have been some I have liked more than others. But I have liked them all until this one. Before I was 100 pages in, I added a note, "Has anyone edited this book?" There were multiple times that something would be discussed, then a page later discussed again. A good example is the list of victims the pathologist provides Banks. He reads it--name, age, residence and status (alive/dead). A page later he asks, what can you tell me about the victims? And the doctor repeats it all. Eh? Annie Cabot, for her delightful flaws, is positively unlikeable in this book. She behaved in petty, mean, and small ways. Although she has been previously described as attractive and tall, here she is second fiddle to Gerry Masterson who takes center stage and is described as tall and beautiful (must be me because I thought she was short and fine-looking, but perhaps not a great beauty since--guess what--Winsome is also tall and beautiful). Mr Robinson has been watching a few too many Tarantino movies I think. A wedding in a remote Yorkshire Church. A sniper takes out the bride and 5 other members of the family (think it was 5, rather a high body count on this) and makes his escape. One of Banks team, Winsome, happens to be a guest and is clipped by a bullet. And there was me praising Book 23 of maintaining relevance to the times and linking the investigation with crime stories that were dominating the news. We appear to have gone of Mr Robinson has been watching a few too many Tarantino movies I think. We appear to have gone of the credibility radar with this one. Story aside - the same hallmarks are here. Effortless writing and a nice sense of melancholy, as Banks realises how much he is aging through past relationships and having a colleagues father (Ray the Artist, from previous books) move in with him. They can sit and drink fine Whisky, listening to great music!